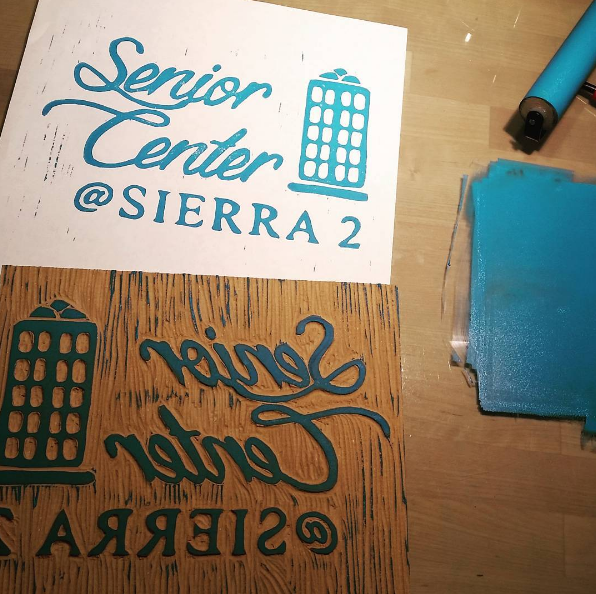 I was thrilled to design a custom logo variation and carve a lino block to print at the Sierra 2 Senior Center Open House. I modified their original logo for larger type and to include an image from their main logo. They chose “e.” from the options below. I carved it in an 8×10 mounted linoleum block. I went in on Monday to promote my event and meet potential students. Promoting my printing booth at the senior center open house. Lots of neat free classes this week at sierra 2. Come on down! The day of the event was great fun. I printed shirts, answered questions, gave demos of carving and talked up the collagraph class I’ll be giving this fall. I love meeting people and printing onsite at events. Consider something different than mass ordering screen printed shirts from China. Event-goers will get to help make their own shirt or bag for a more memorable experience. Happy warm fuzzies for all!